(P1) The FBI is operating a small air force with SCORES of low-flying planes across the country carrying video and, at times, cellphone surveillance technology — all hidden behind FICTITIOUS companies that are FRONTS for the government, The Associated Press has learned. 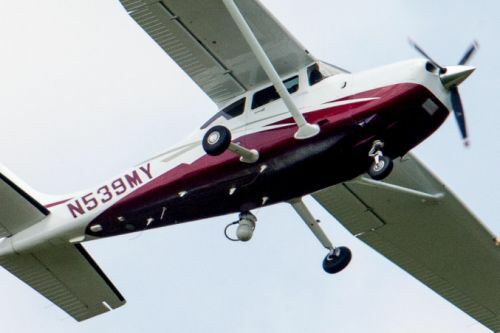 (P2) The planes’ surveillance equipment is generally used without a judge’s approval, and the FBI said the flights are used for specific, ONGOING investigations. The FBI said it uses front companies to protect the safety of the pilots and aircraft. It also SHIELDS the identity of the aircraft so that suspects on the ground don’t know they’re being watched by the FBI. (P3) In a recent 30-day period, the agency flew above more than 30 cities in 11 states across the country. (P4) Aerial surveillance represents a changing frontier for law enforcement, providing what the government maintains is an important tool in criminal, terrorism or intelligence probes. But the program raises questions about whether there should be updated policies protecting CIVIL LIBERTIES as new technologies pose INTRUSIVE opportunities for government spying. (P5) U.S. law enforcement officials confirmed for the first time the wide-scale use of the aircraft, which the AP traced to at least 13 fake companies, such as FVX Research, KQM Aviation, NBR Aviation and PXW Services. (P6) Even basic ASPECTS of the program are WITHHELD from the public in CENSORED versions of official reports from the Justice Department’s inspector general. (P7) The FBI also has been careful not to reveal its surveillance flights in court documents. (P9) But the planes can capture video of unrelated criminal activity on the ground that could be handed over for prosecutions. (P10) Some of the aircraft are equipped with technology that can identify thousands of people below through the cellphones they carry, even if they’re not making a call or in public. Officials said that use of this technology is rare. (P11) Details confirmed by the FBI track closely with published reports since at least 2003 that a government surveillance program might be behind suspicious-looking planes slowly circling neighborhoods. The AP traced at least 50 aircraft back to the FBI, and identified more than 100 flights since late April orbiting both major cities and rural areas. (P12) One of the planes, photographed in flight last week by the AP in northern Virginia, BRISTLED with unusual ANTENNAS under its FUSELAGE and a camera on its left side. A federal budget document from 2010 mentioned at least 115 planes, including 90 Cessna aircraft, in the FBI’s surveillance FLEET. (P13) The FBI also occasionally helps local police with aerial support, such as during the recent disturbance in Baltimore that followed the death of 25-year-old Freddie Gray, who suffered GRIEVOUS injuries while in police custody. Those types of requests are reviewed by senior FBI officials. (P14) The surveillance flights COMPLY with agency rules, an FBI spokesman said. Those rules, which are heavily REDACTED in publicly available documents, limit the types of equipment the agency can use, as well as the JUSTIFICATIONS and DURATION of the surveillance. (P15) Details about the flights come as the Justice Department seeks to deal with privacy concerns arising from aerial surveillance by unmanned aircrafts, or drones. President Barack Obama has said he welcomes a DEBATE on government surveillance, and has called for more TRANSPARENCY about spying in the WAKE of DISCLOSURES about classified programs. (P17) During the past few weeks, the AP tracked planes from the FBI’s fleet on more than 100 flights over at least 11 states plus the District of Columbia, most with Cessna 182T Skylane aircraft. These included parts of Houston, Phoenix, Seattle, Chicago, Boston, Minneapolis and Southern California. (P18) EVOLVING technology can record higher-quality video from long distances, even at night, and can capture certain identifying information from cellphones using a device known as a Stingray. These can trick PINPOINTED cellphones into revealing identification numbers of subscribers, including those not suspected of a crime. (P19) Officials say cellphone surveillance is rare, although the AP identified FBI flights orbiting large, enclosed buildings for extended periods where aerial photography would be less effective than electronic signals collection. (P20) “Aircraft surveillance has become an INDISPENSABLE intelligence collection and INVESTIGATIVE technique which serves as a FORCE MULTIPLIER to the ground teams,” the FBI said in 2009 when it asked Congress for $5.1 million for the program. (P21) After The Washington Post revealed flights by two planes circling over Baltimore in early May, the AP began analyzing detailed flight data and aircraft-ownership registrations that shared similar addresses and flight patterns. (P22) Recently, independent journalists and websites have identified mysterious companies traced to post office boxes in Virginia, including one shared with the Justice Department. The AP analyzed similar data since early May, while also drawing upon aircraft registration documents, business records and interviews with U.S. officials to understand the SCOPE of the operations. (P23) The FBI asked the AP not to disclose the names of the fake companies it discovered, saying that would SADDLE taxpayers with the expense of creating new fronts to shield the government’s involvement, and could endanger the planes and INTEGRITY of the surveillance missions. The AP DECLINED the FBI’s request because the companies’ names — as well as common addresses linked to the Justice Department — are listed on public documents and in government databases. (P24) At least 13 front companies that AP identified being actively used by the FBI are registered to post office boxes in Bristow, Virginia, which is near a regional airport used for private and CHARTER flights. Only one of them appears in state business records. (P25) Included on most of the aircraft registrations is a mysterious name, Robert Lindley. He is listed as chief executive and has at least three distinct signatures among the companies. Two documents include a signature for Robert Taylor, which is strikingly similar to one of Lindley’s three handwriting patterns. (P26) The FBI would not say whether Lindley is a U.S. government employee. The AP unsuccessfully tried to reach Lindley at phone numbers registered to people of the same name in the Washington area since Monday. (P27) Law enforcement officials said Justice Department lawyers approved the decision to create fictitious companies to protect the flights’ security and that the Federal Aviation Administration was aware of the practice. One of the Lindley-headed companies shares a post office box openly used by the Justice Department. (P28) Such ELUSIVE practices have endured for decades. (P29) The FBI does not generally obtain WARRANTS to record video from its planes of people moving outside in the open, but it also said that under a new policy it has recently begun obtaining court orders to use the Stingray device. The Obama administration had until recently been directing local authorities through secret agreements not to reveal their own use of the devices, even encouraging prosecutors to drop cases rather than disclose the technology’s use in open court. (P30) A Justice Department memo last month also expressly BARRED law enforcement agencies from using unmanned drones “solely for the purpose of monitoring activities protected by the First Amendment” and said they are to be used only in connection with authorized investigations and activities. A department spokeswoman said the policy applied only to unmanned aircraft systems rather than piloted airplanes. Nowadays, everywhere we go and everything we do, we are being watched. Does this make you feel safer, or does this make you angry? What sorts of activities are governments trying to discover by using surveillance technologies? Have you ever seen a drone or a mysterious aircraft in person? Are you careful about what you do in public, because of the presence of CCTV cameras and other technologies?